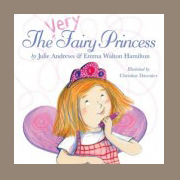 While her friends and family may not believe in fairies, Geraldine knows, deep down, that she is a VERY fairy princess. From morning to night, Gerry does everything that fairy princesses do: she dresses in her royal attire, practices her flying skills, and she is always on the lookout for problems to solve. But it isn’t all twirls and tiaras – as every fairy princess knows, dirty fingernails and scabby knees are just the price you pay for a perfect day! Recorded by Emma Walton Hamilton.